After giving up our rights in any situation that makes us angry, it’s much easier to get TO THE ROOT cause of why you might be angry. In our verse for today, the scripture speaks of having a root of bitterness by which we can become defiled. I want us to look at two different types of roots here. First, there is the root of bitterness, or the root that is causing the anger to arise. Second, let’s examine the root of the vine that, as Christians, we are engrafted into. Jesus says, I am the vine, you are the branches. Speaking of Jesus, Isaiah said: And in that day there shall be a Root of Jesse, who shall stand as a banner to the people… That’s the root we want to be tapped into. He is our TAP-ROOT! When you feel anger arising, pray and ask God WHAT IT IS HE IS TRYING TO SHOW YOU. Let Him lop off those unhealthy branches in your heart. Often, my wife, Cindy, and I STOP TO PRAY when we are in the middle of an anger-filled argument. I encourage you to do the same, whether with your spouse, or with a friend who also knows the Lord. I have to admit, that is one of the hardest things to do . . . but in the end, it is the most effective thing we can do. God exposes the truth of our heart attitudes, He flays away that bitter root. It’s pretty tough to talk to the Lord in the presence of your supposed adversary without letting go of your rights, and getting to the root issue. 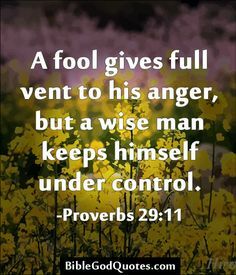 If your anger is with someone who is not a follower of Christ, then simply tap into the living Vine, the Lord Jesus Christ, and ask Him to expose the root cause of your anger.